A Clear Acrylic Riser uses Bent 5mm Thick Plastic to Create Stands! 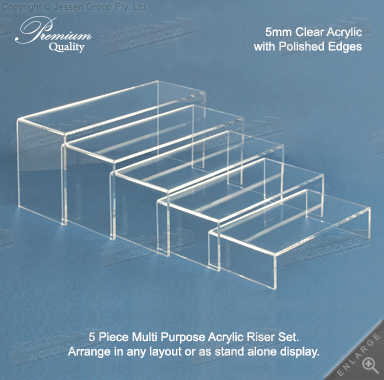 This clear acrylic riser is a multi-purpose set that is perfect for use in many different locations. 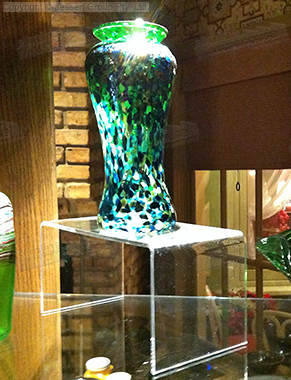 Retail stores, bakeries, cafes, museums, art exhibitions, jewelry shops, and more will find this set of displays an outstanding way to present goods and merchandise to customers in an eye-catching fashion to attract attention! 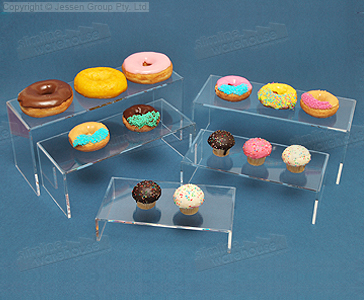 The retail stands set, clear acrylic riser includes (5) shelves that are of different heights. These displays feature a nesting design that allow you to place them within each other when not in use to easily store the stands. You can also create different configurations, allowing your marketing team to make an intriguing display that best showcases your products to passersby. These plastic stands are made from 5mm clear acrylic for a durable stand that is able to be used in heavily-trafficked locations with ease. 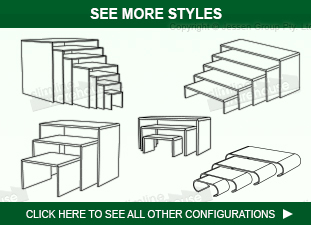 Each of the (5) shelves has polished edges that provide a professional look that works well within any décor. This display set makes a welcome addition to any store, where they are able to be easily placed on counters, desks, or tables! This set of products allows you to elevate merchandise on your counters, making it easy to have more items readily available in a smaller area. This style of product also helps to gain more attention for potential customers, making it easier for employees to engage in conversation and help to upsell your goods! 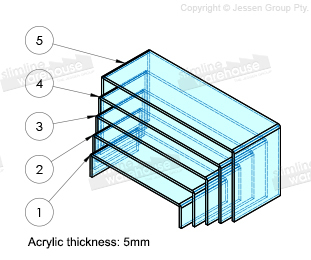 The various plastic stand sets that we are offering include different sizes & numbers of shelving displays you receive in order to offer customers a suitable unit for differing needs. There are heaps of styles & sizes of these products for you to choose from to place at your business to really attract attention. Click here to see our expansive online catalogue, where there are hundreds of POP, retail, POS, & exhibition displays to choose from for your location. With over 20 years in the business, Slimline Warehouse has become a national leader that is renowned for offering top-quality goods at low prices. Orders paid prior to 1pm EST will despatch same day with most in stock products to Sydney, Melbourne, Perth, Canberra, Adelaide, Brisbane, & anywhere else around Australia!